At Gynzy we think it is important to listen carefully to teachers’ feedback in order to offer the best digital learning experience possible. During the summer break we haven’t been standing still and used teachers’ feedback to create some great improvements for Gynzy. In this blog we would like to give you a short introduction on one of the new features. 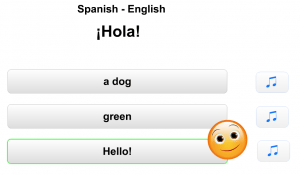 The new feature we would like to introduce to you this week is the possibility to add your own sounds to your lessons. Why adding your own sounds? Over the last months, several teachers sent us the feedback that they would love to add their own sounds to their lessons. Gynzy really appreciates this feedback and agreed that it would be valuable to add this feature. Teachers have always loved using our Sound Library to create even more engaging lessons by adding auditory elements to a mostly visual experience. Now, not only do you have access to our catalogue of sounds, you can also add your own sounds. 1. Record your student’s voice shouting out, ‘Well done!’ and ‘Try again!’. Add the ‘Well done!’ sound to a correct answer and ‘Try again!’ to false answers in your lessons. When a student picks an answer, the whole class will hear their voices. Your students will love it! In order to easily create MP3 recordings use the free online tool Record MP3. 2. Use your own music in your classroom. Adding your own music is clearly a great benefit for music teachers. Let your students experience different sounds of music and rhythms. 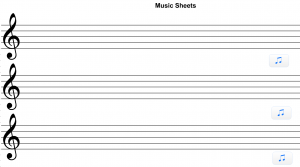 Add the music to the music sheet tool and let your students hear the difference between pitches. Invite your students to the front of classroom and let them draw the music notes on the right places. 3. 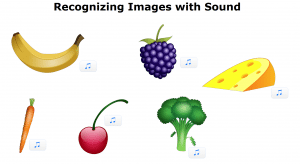 For the younger students you can add sounds to images. This will help students recognize words. For instance, adding the sound of a sheep to an image of a sheep. You can also help your students with the pronunciation of difficult words. Read the article of Carol Ingram in which explains how she uses sounds when teaching reading in pre-school. How would you use your own sounds in your lesson? Share it with us in the comments below. You can add your own sounds in the sound library. We have created a short video to explain this new feature. If your file is not in mp3 format already, you can transform it to an MP3 file. If you are a Windows user read the instructions on www.dummies.com for an easy explanation on how to create an .mp3 file. If you are an Apple user, use GarageBand to record your voice. To save any file as an .mp3 file read the instructions of Apple support. Don’t want to record your own voices or do not have the right sound in your library? Try the website SoundBible This is a great resource for downloading free sounds. If you want to add music or a song to your lesson, take a look at the website MP3.com. Here you can easily download free music. Have fun using this new feature!